Chalet Santa Iria is located in Ribeira de Santarém. This magnificent building, dated from the late 19th century, was recently renovated. Featuring a noble location, this space stimulates a privileged view over the Tagus, the Lezírias and the Ribeira itself. The bedroom - suite may have a double bed or twin beds. Guests will have private access to the entire first floor of the house which includes an entrance hall, kitchen, large hallway, 2 bedrooms (one with a big double bed and a suite with double bed or twin beds), dining room and two bathrooms. You will be given total privacy to enjoy these areas during your stay. You will be able to use all exterior areas such as the patio, the garden and the private parking. The house has free and unlimited Internet Wi-fi. 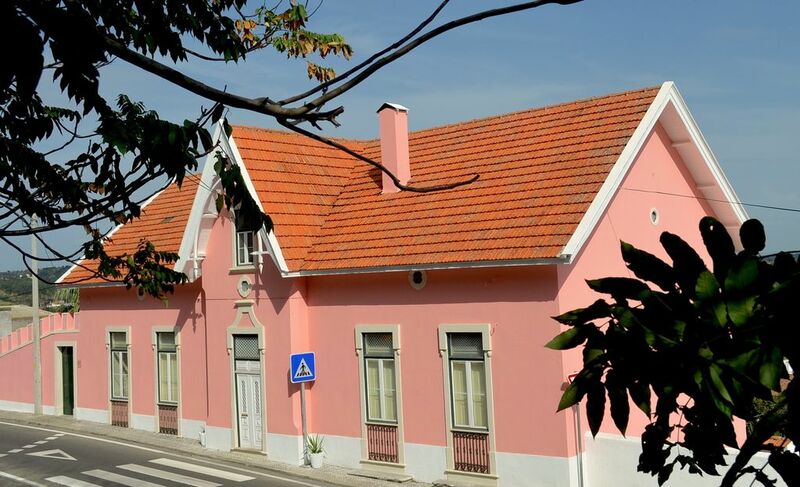 Chalet Santa Iria is located in the city of Santarém, capital of the Ribatejo region, more precisely in Ribeira de Santarém and two steps from D. Luis I Bridge, which connects Santarém to the city of Almeirim by National Road 114. It is conveniently accessible from Lisbon or from Porto by A1 highway . It is 70 km, about 45 min, by car from Lisbon Airport and 250 km from Francisco Sá Carneiro Airport, in Oporto. From Santarém train station it is only 10 minutes walking distance. If you come by bus, it is a 10-minute drive or taxi ride from the city's bus station. The nearest beach, Foz do Arelho, is a 40-minute drive away. Casa encantadora, com uma decoração excelente, cama muito confortável,. A destacar a simpatia dos donos,, sempre disponíveis. Muito obrigada pelas suas gentis palavras sobre a simpatia, a decoração e o conforto das camas, pretendemos que os nossos hóspedes tenham a maior liberdade e comodidades para criarem momentos memoráveis. Ficamos extremamente felizes de saber que gostaram da estadia e que nos darão oportunidade de vos voltar a receber sempre que regressarem a Santarém. Para nós, será um verdadeiro prazer dar-vos novamente as boas-vindas. Adorámos a nossa estadia no Chalet! The house is large with a full kitchen. The view of the river from the kitchen, bedrooms, and bathroom is beautiful. The beds and pillows are very comfortable. It gets a bit chilly in November but there are space heaters to take the chill out. The decor is a nice mix of antiques and modern. There is not a washing machine but there is a line to dry your clothes if you hand wash a few things. The hostess Marissa is delightful. She speaks English very well and is very helpful if you need anything including places to go for wine tasting or the best coffee and pastries. She has nice little extra touches like a bottle of water and nice chocolate in the bedrooms and Port wine in the foyer. There is a hair dryer and makeup mirror in the bathroom. Parking is a little challenging but there are a couple of solutions that work. I would love to have stayed much longer. Thank you so much for taking the time to provide your feedback after your stay at the Chalet. For me, it was such a pleasure to welcome you and have the opportunity to meet you. I am delighted that you enjoyed your stay, the house, the view and the little extra touches. We have put great attention in the quality of our products, I am glad that you found the bed and the pillows very comfortable, they are all made in Portugal with the finest materials what make us very proud of them. I really look forward to welcome you again at Chalet Santa Iria in the near future.